No, you can't limp it home: A Corvair overheats instantly after throwing a fan belt. Good thing it's really easy to replace. Always have a spare! The Otto Superbelt looks more or less the same as other belts, but promises to stay in place. Early results are encouraging. 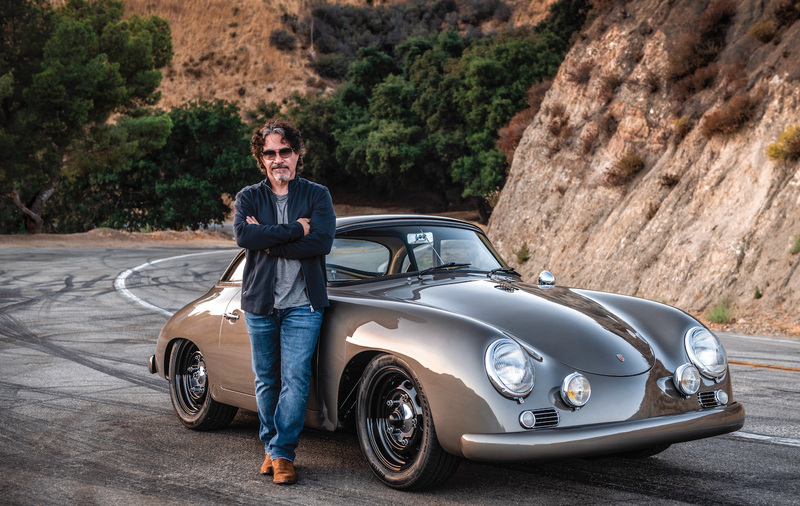 When we tested our Corvair against a 356 Porsche for an upcoming story, we had a fan belt fly off. 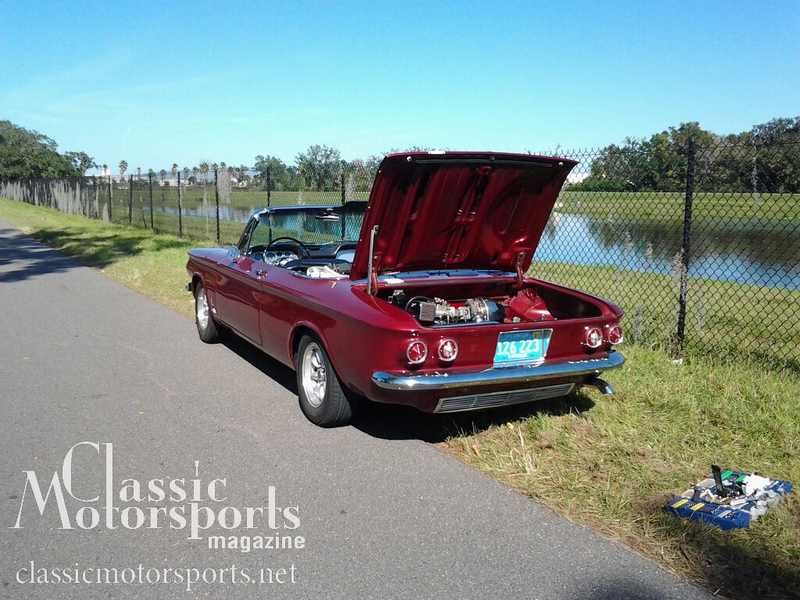 When we tested our 1963 Chevrolet Corvair Monza Spyder against a 356 Porsche for an upcoming story, we had a fan belt fly off. While this was considered a common problem in the early days of Corvair ownership, several things introduced in 1964, including a factory belt guard, helped alleviate the problem. 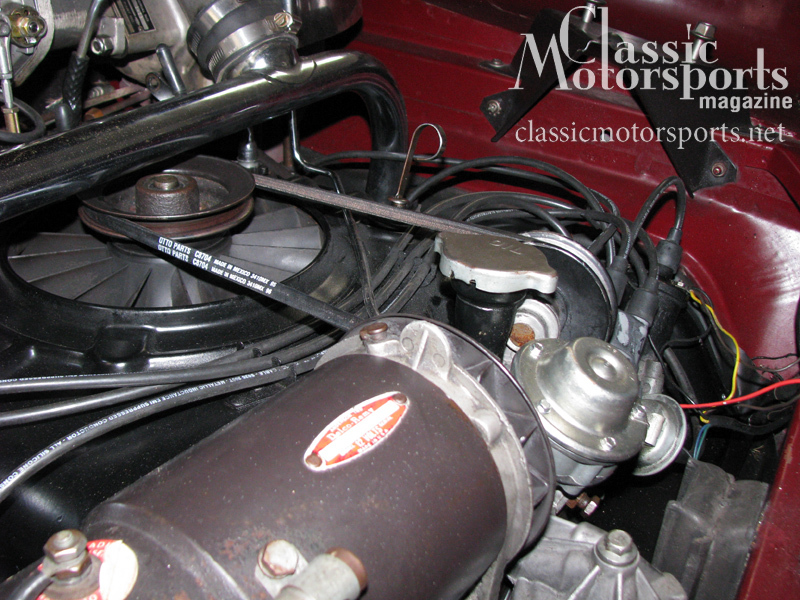 Even though we have this guard installed on our earlier 1963 Spyder, we were still having the occasional belt problem. 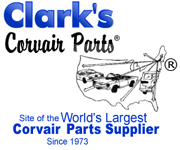 We called our partners at Clarks Corvair Parts, Inc. and asked the what they suggest. They sent us one of their Otto Superbelts. This custom-made belt has a little bit deeper V and is supposed to stay on the Corvair better than lesser belts. We were anxious to give it a try and found it fit well and seemed to solve the problem. The instructions call for about an hour of light duty use to help the belt take a set to the pulleys. The instructions also recommend a bit of silicone spray on the pulleys to help the belt enter the pulleys better at high rpm. We will report back in a few months, but so far, this has been a cheap and easy cure for an annoying problem. 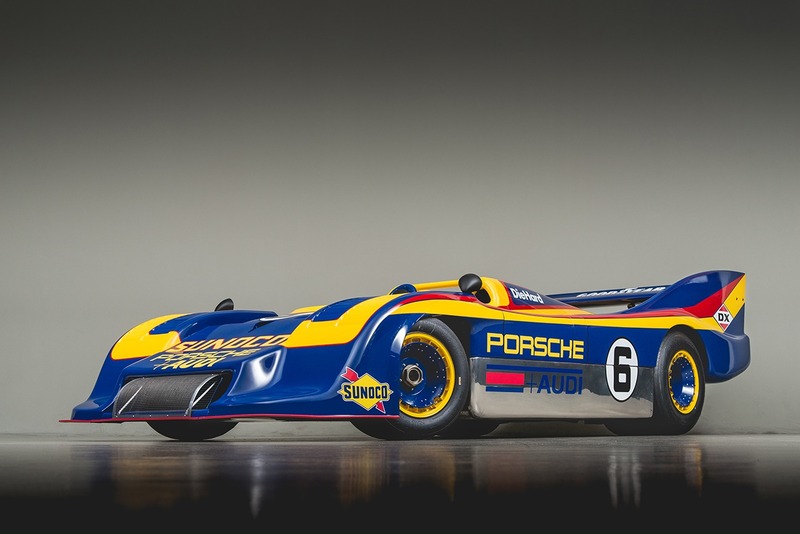 I've had my 1965 Corsa turbo convertible since 1987, and I've never thrown a fan belt on it (even when driving it during college like a bat out of hell)... well, except for the one time when my alternator seized up and flipped the belt. I've alway used "Clark's Ultimate" fan belts, so hopefully their Otto belt will solve this issue for you. The '64 - later magnesium fan is lighter than the '63 part. Lower weight => lower inertia => less belt stretch => reduced tendency to throw the belt. IIRC the belt gets thrown on rapid decreases in RPM, such as lifting for a shift during hard acceleration.